Deep philosophical issues and perplexing textual questions are carefully examined and discussed in clear and incisive fashion. The actions and motivations of the patriarchs, matriarchs and other biblical figures are probed with an eye towards determining the lessons to be learned from the lives of these great personalities. Clear distinction is made between pshat straightforward literal meaning and Midrash rabbinical exegesis as both of these approaches to biblical text are carefully defined and applied. Finally, thought-provoking connections are raised between the eternal Torah narrative and critical issues of our time. 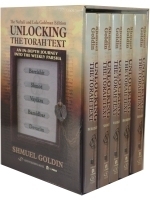 Each study is thus constructed to encourage continued discussion and study of the Torah narrative.